Carmine Bee-eaters are carmine in color, except for its greenish blue head and throat, and the bold black mask-like stripe across their eyes. Their eyes are red and they have a black pointed de-curved beak. Their central tail feathers are elongated. Their legs and feet are blackish brown. The sexes are similar in appearance. It is one of the largest species of Merops at 35cm long. Young birds lack the elongated central tail feathers and are pinkish brown on the mantle, chest to belly, and flanks. In Kenya they are passage migrant in the area and its distribution is found in the north western part of Kenya, extending all the way to coast, in areas around Watamu, Tsavo east, Meru national park, Turkana, Nasolot, Kerio Valley and Lake Baringo. 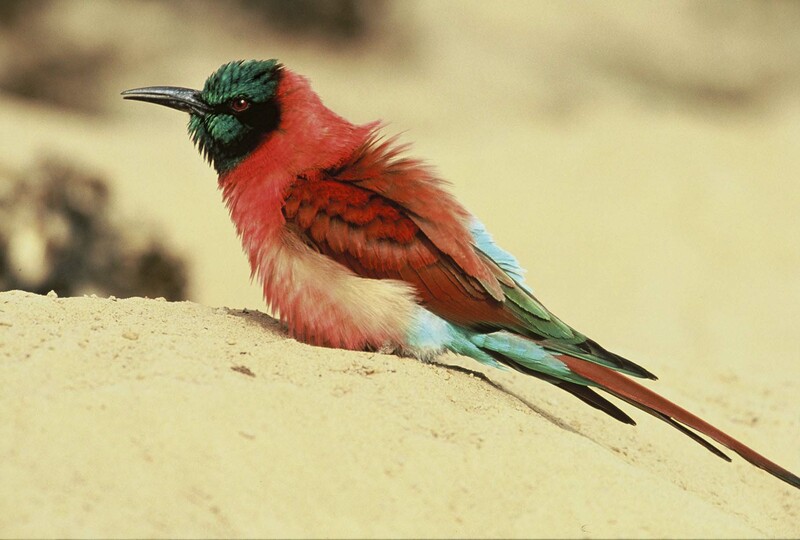 Northern Carmine bee-eaters hunt mainly by keeping watch for flying insects from a perch. The insect is snapped up in the bill, then the bird returns to the perch, where it beats the prey against the perch until it is inactive. A stinging insect is held near the tip of its tail and rubbed on the perch to be relieved of the venom and sting before being swallowed whole. Besides branches, Carmine Bee-eaters use the backs of game or cattle and even large birds, such as Jacksons Bustard or Storks as animate perches, waiting to catch any insects that they disturb. Carmine Bee-eaters also fly freely to bush fires to prey upon fleeing insects. For the last 10 years of my birding life, I have never came across any species of bee-eater which fails impress!!! Have a great birding week.